På tisdagen den 7 oktober premierades Per Gessle och Mats MP Persson av BMI i London för att "Listen To Your Heart" passerat 4 miljoner spelningar i amerikansk radio! Här ser ni bilder från galan. 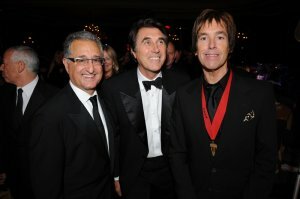 BMI's President & CEO Del Bryant; BMI Icon Bryan Ferry and Per Gessle. Amund Bjorklund, winner of The Robert S. Musel Award, (TONO) for "Irrecplaceable"; RedOne (STIM) winner of a Pop Award for "Whine Up"; Per Gessle (STIM) winner of a 4 million performance award for "Listen To Your Heart"; Mercury/Interscope recording artist Pixie; Mats Persson (STIM) winner of a 4 million performance award for "Listen To Your Heart" and Espen Lind (TONO) winner of The Robert S. Musel Award for "Irrecplaceable."